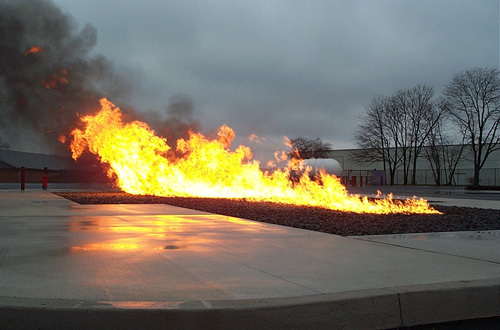 The Flammable Liquids and Fuel Spill Fire Simulator is vapor and liquid propane fired. All burners are located under a stone base and the entire simulator is at ground level. The vapor fueled burners can be used for fire extinguisher training and also simulate a running fuel fire. The liquid propane fired burners simulate a large burning spill. The simulator can be attacked with water streams or foam.